The buildings that comprise the Rollins School of Public Health are named to honor the Rollins family. They include Pam Rollins, Randall Rollins, Gary Rollins, Amy Rollins Kreisler, and Peggy Rollins. Henry Tippie (back row, left) is a trustee of the O. Wayne Rollins Foundation. The O. Wayne Rollins Foundation recently gave the Rollins School of Public Health at Emory University $10 million for the O. Wayne and Grace Crum Rollins Endowment Fund. 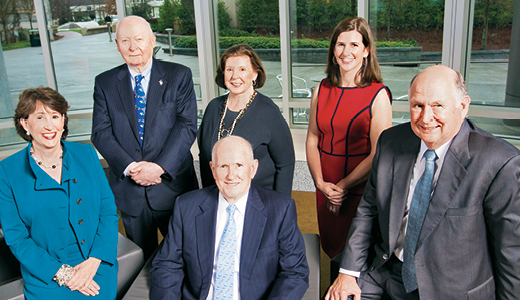 Longstanding benefactors of the school, the Rollins family is doubling the endowment fund established by the school in 1997. "We are genuinely grateful to the Rollins family for their dedication to the mission and vision of the Rollins School of Public Health," says James Curran, MD, MPH, James W. Curran Dean of Public Health. "Their commitment to our school has led to tremendous advancements in research, the recruitment of outstanding faculty leaders and recognition as one of the world’s most successful schools of public health." This unrestricted endowment fund supports the school’s highest priorities. Over the past quarter century, the Rollins family’s exceptional generosity has enabled the school to build the Grace Crum Rollins and Claudia Nance Rollins buildings and recruit and retain key faculty leaders. "As the global focus of public health increases," explains Curran, "gifts such as this one from the Rollins family aid in our efforts to advance innovation and knowledge in public health practice as we simultaneously work on the frontlines in our field and train future pioneers in public health."